St Isidore the Farmer was born into a very poor but devout family in Madrid. He lived his life as a farm labourer yet found the time for daily devotion to prayer and often attended daily Mass. He married and had a child. One day the child fell into a deep well. His distraught parent’s prayed intensely as they tried to help. Miraculously they watched the water level rise to bring the child to the surface. St Isidore was well known for his many miracles but he also had critics. Fellow workers once complained that he often arrived late in the morning for work because he attended Mass. His master, while investigating their complaint found St Isodore in Church but an “Angel” ploughing the field. On another occasion, he was seen ploughing a field with an Angel on either side of him. St Isidore’s wife would often keep a large pot of stew on the boil for her husband when he returned from work, knowing he was likely to be accompanied by poor people he met along the way. On occasions, the pot seemed to miraculously feed many more than physically possible. 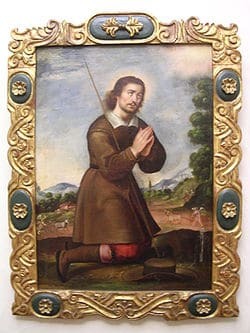 St Isidore is the Patron Saint of Farmers and bricklayers as well as his home city, Madrid. His Feast Day is the 15th May, the day of his death, aged 59. Pray for us that we will diligently go about our daily work and find quality time to talk to the Risen Jesus.